Soak a tea or flour-sack towel in melted butter and place over it while it roasts. 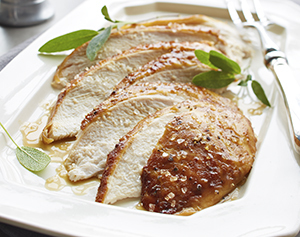 This is further guarantee that the breast will remain juicy and flavorful. * Size of bird depends on number of people eating. Consider using one pound of turkey per person. Pre-heat over to 325 degrees Fahrenheit. Remove turkey from brining pot and pat dry with paper towels. Place in a shallow roasting pan breast-side up. Cooking time will depend on the bird’s size and if it is stuffed, so will range from 13 to 25 minutes per pound. Check the turkey’s package recommendations for proper cooking time. Use a meat thermometer to test if turkey is done roasting. Proper temperature of the bird should be 185 degrees in the thigh and 170 degrees in the breast. Soak a tea or flour-sack towel in melted butter and place over the breast while it roasts. This is further guarantee that the breast will remain juicy and flavorful. If stores in your area don’t sell Diamond Crystal® Kosher Salt, don’t worry! Just call 1-800-428-4244 or visit www.diamondcrystalsaltstore.com and you can have a box shipped directly to your home.